NEW YORK, New York, May 13, 2016 (ENS) – The ongoing poaching of the oldest and wisest female forest elephants could cause cascading harmful effects on the integrity of entire rainforest ecosystems, new research shows. These “ecosystem engineers” maintain the habitats on which many other plant and animal species depend . The essay, entitled “Consequences for elephants and forests: poaching and anthropogenic change,” appears in the online version of Conservation Biology. The authors are: Thomas Breuer of the Wildlife Conservation Society based at the Bronx Zoo; Fiona Maisels of the Wildlife Conservation Society and the UK’s University of Stirling; and Dr. Vicki Fishlock of the Amboseli Trust for Elephants and the University of Stirling. Scientists conducting long-term studies on savannah elephants have documented many, and long-lasting, effects of poaching and other human disruptions on their behavior. Savannah elephants exposed to poaching become more nocturnal and more skittish outside of the protected areas, where more and more elephants crowd together, say the scientists. The forests there become degraded as many more elephants graze and browse on the foliage. The loss to poachers of older individuals, both male and female, destabilizes the population socially and robs other elephants of the survival skills of the most experienced members, the scientists conclude. Breuer and his co-authors say forest elephants are probably experiencing, and causing, the same behavioral and ecological changes in their ecosystems as savannah elephants. Forest elephants disperse the seeds of many plant and tree species, maintain trail systems and natural forest clearings, and distribute and renew soil nutrients across enormous areas. Their role as ecosystem engineers maintains the habitats on which many other plant and animal species depend. In 1968, Cynthia Moss began to study elephants in northern Tanzania with Iain Douglas-Hamilton. Four years later, with Harvey Croze, she found ideal conditions for studying elephants in Amboseli National Park. Since 1972, the Amboseli Elephant Research Project has monitored the Amboseli Park elephants, identifying all the individuals in the population and gathering data on births, deaths and behavior. Today Moss’s work is the world’s longest-running study of wild elephants, documenting the lives and deaths of almost 3,000 elephants. The Amboseli Elephant Research Project is now a hub for research collaboration and training. One of the of the longest-studied populations of free-living large mammals in the world, the AERP is a critical source for baseline data on elephants. “Ensuring the survival of the elephant in today’s Africa is an increasingly complex problem. The ivory trade – legal and illegal – and the tremendous increase in human population in Africa have taken a serious toll,” say the authors. In 1979, there were estimated to be 1.3 million elephants in Africa; 10 years later, there were only about 600,000. In Kenya alone, the elephant population dropped from 130,000 in 1973 to less than 20,000 in 1989 – loss of 85 percent. The elephant population in Amboseli National Park is one of the few that has been able to live relatively undisturbed in natural conditions. This rare situation is due to the presence of researchers and tourists in the park, and the support of the local Maasai people. In the absence of poaching and culling, the Amboseli elephant population has been increasing slowly since the late 1970s. 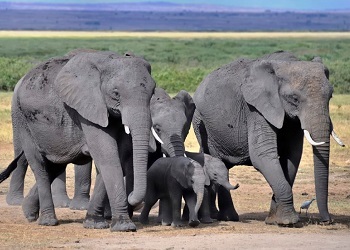 Amboseli is, therefore, one of the few places in Africa where the elephant age structure has not been drastically skewed and the population spans the whole range from newborn calves to old matriarchs in their 60s and, even more unusual, many large adult bulls in their 40s and 50s. 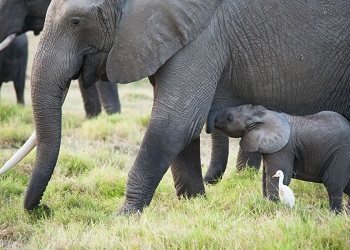 “We should assume that these disruptions of forest elephant society and rainforest ecology are occurring, and that these assumptions need incorporation into conservation planning,” said Dr. Fishlock, a resident scientist at Amboseli since January 2011. Leadership and negotiation in the face of risk is her focus and social disruption and recovery in elephant families after the area’s terrible drought in 2009 . The guardians of their community’s forest and social knowledge, elephant matriarchs guide their families to crucial resources – water in savannahs or scarce fruiting trees in rainforests – and hold decades of geographical and social knowledge. Copyright Environment News Service (ENS) 2016. All rights reserved.